The scientific name for a Japanese beetle is Popillia japonica. 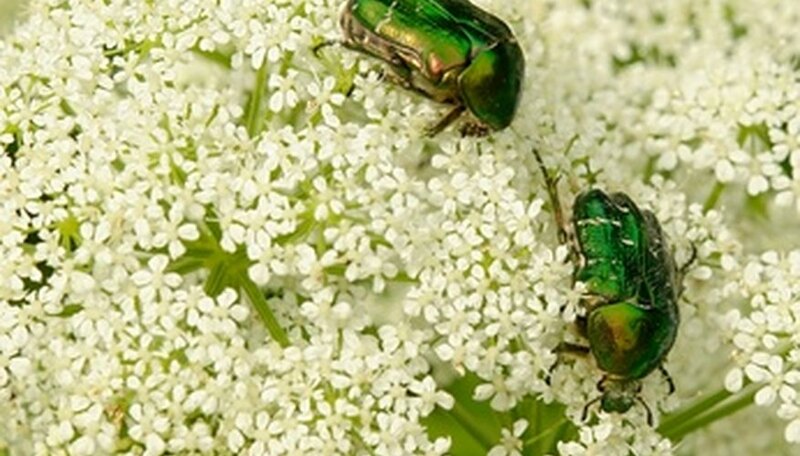 Japanese beetles are known for their greenish metallic color. They only reach between 8 and 11 mm in length. According to Ohio State University, these small beetles eat the leaves and flowers of over 300 varieties of plants. This can cause severe damage to the plants. It is best to stop the Japanese beetles as soon as you notice that they have found their way into your garden. Put on a pair of plastic gloves, and prepare the dish soap and water. Mix 2 tsp. of dish soap with some hot water. If you have leftover dish water from doing the dishes, that will work as well. Pick the Japanese beetles off of the plants, and deposit them into the soapy water to kill them. It is best if you do this first thing in the morning, or at night just before bed. The beetles are not as active during those hours. Spray the plants first thing in the morning with a garden hose to knock the Japanese beetles off the plants. This can be done if you do not have time to pick off the beetles and kill them in the soapy dish water. You will, however, have to keep doing this each morning, as some of the Japanese beetles may survive and climb back up the plant. Use an insecticide that contains either the ingredient carbaryl or bifenthrin. According to the University of Minnesota, these active ingredients have the power to kill the adult Japanese beetle. Always follow the directions on the insecticide carefully. Try planting holly, lilacs, or red maple. According to the University of Kentucky, these plants are seldom ever attacked by Japanese beetles. Japanese beetle traps can actually bring more beetles onto your property. It is best not to use them.